You’re driving in an SUV up a 3,000 meter high summit. The wheels on the rocky road send dust spiralling into the vivid blue sky. Around you is only nature until, out of nowhere, a building suddenly rises up out of the rocks like a mirage. And it’s not just any building. 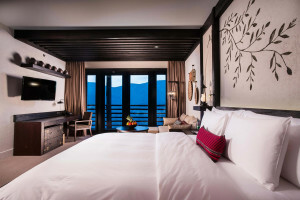 It’s the impeccably-designed 5 star Jabal Akhdar Hotel. Already you’re feeling like you’ve nodded off on the train to work and woken up inside a James Bond movie. 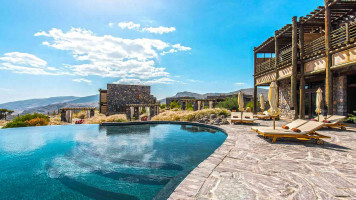 What Makes Jabal Akhdar Luxury Mountain Hotel Special? There’s the infinity pool with an uninterrupted view of the striking mountain landscape. There’s the local craftsmanship and exotic Omani influences of the decor. There’s the intimacy, the seclusion, and the pure, unadulterated luxury. 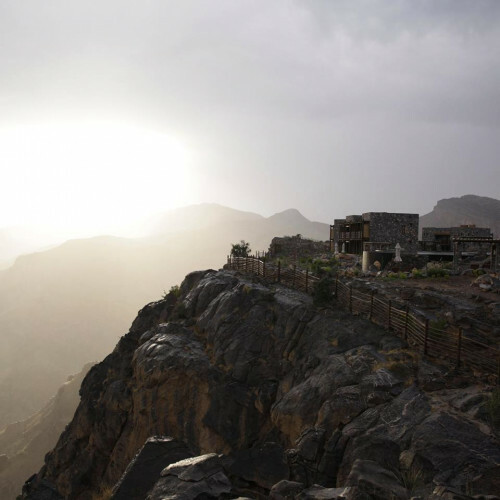 Built from the ancient minerals and rocks of its surroundings, the Jabal Akhdar Luxury Mountain Hotel is designed to blend seamlessly into the landscape. Though we prefer the term camouflage — because who doesn’t want to pretend they’re in a billionaire Bond Villain hideout in the Omar mountains? Luxury and adventure all rolled into one: this mountain retreat is not to be missed.